We love our Community Spirit initiative and the way it connects us to important causes coast to coast. Our Brampton location was proud to show its support for the Peel-Dufferin chapter of the Multiple Sclerosis Society of Canada earlier this month, with a donation towards its work fighting MS. Brampton store manager John Jacklin (far right) and area manager Paul deSouza (near right) presented a cheque for $5,000 to Suzanne Bracken, Fundraising & Community Outreach Coordinator for Peel-Dufferin. 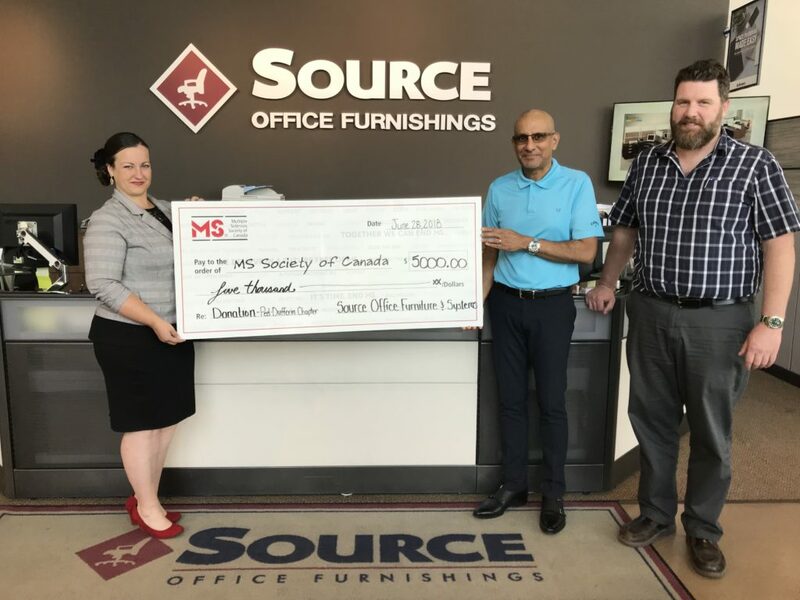 Source staff at each store choose the local organization they want to support, and the MS Society has been a long-time favourite of our Brampton crew. Thanks, John and Paul! Source Office Furnishings — Making Your Office Work Better!